It’s apparently National Lampoon season right now in Hollywood, when the screenwriters and producers of today try to emulate the comic legends of yesteryear. We’ve already reported quite a bit on A Futile And Stupid Gesture, Netflix and David Wain’s star-studded biopic about the magazine’s founding, which features Will Forte in the key role of magazine co-founder Doug Kenney. 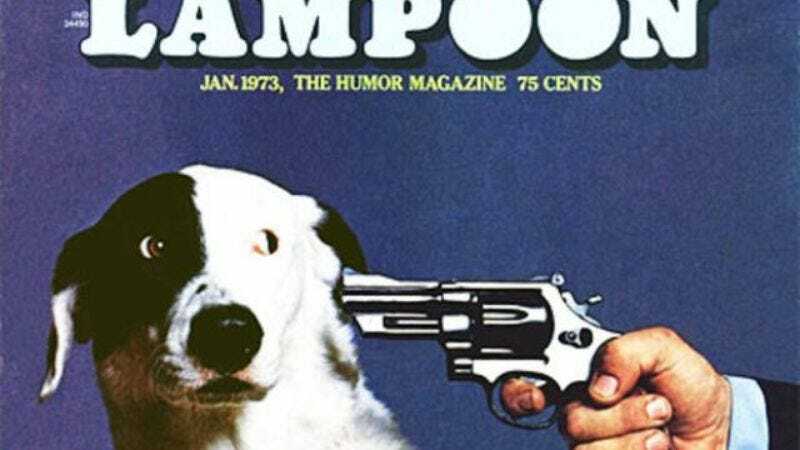 Now, A&E has announced that it’s starting development on a Lampoon show of its own, a “fictionalized” series based on a recent documentary centering on those same events. At least, that’s their intent. The producers of Drunk Stone Brilliant Dead—which include magazine co-founder Matty Simmons, in a consulting role—are apparently avoiding the potential legal challenge by pushing hard on that “fictionalized” element, saying they “won’t specifically portray the origin events of the National Lampoon company nor re-enact its characters.” (The Netflix movie, meanwhile, just paid the company a licensing fee for its logo and old pictures.) So stay tuned to A&E for the upcoming TV adventures of Ken Dougey and the whole American Goof-Ems crew, as they threaten hogs and transcend nultural corms in their search for a lasting comedy legacy—one that definitely won’t flatline 40 years later, in a slew of low-brow garbage and transphobic, direct-to-DVD trash.